Here’s all about an amazing special offer that is sure to get in touch with your inner super hero by giving you more bang for you buck. 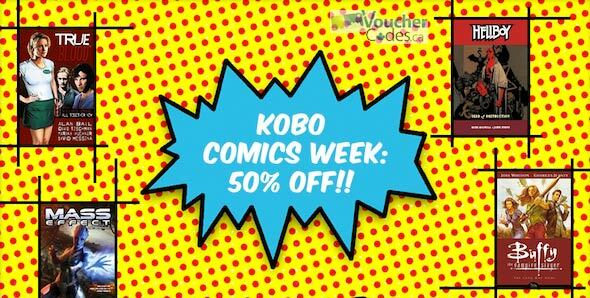 For a limited time, use this fantastic promo code and enjoy 50% off all graphic novels at Kobo. Isn’t this a pretty powerful deal? I’m feeling like Batman already. Bring on the villains (and the bold type). For all the trekkies out there, I know there are a lot of you, take note that with this deal you’ll be able to get Star Trek Volume 1 for just over $3.50. Is that too old school for you? Get a True Blood comic for just under 5 bucks. While I’ve never personally been into comic books too much, I remember that as a kid it’s the only form of literature that my brother would consume. Are you like that? Or are you having trouble getting your kid to read. Maybe getting them into graphic novels could help them appreciate reading–whatever it takes right?